As Dashain holidays approaches to end, this boy take pleasure flying kites in Chobar one evening. 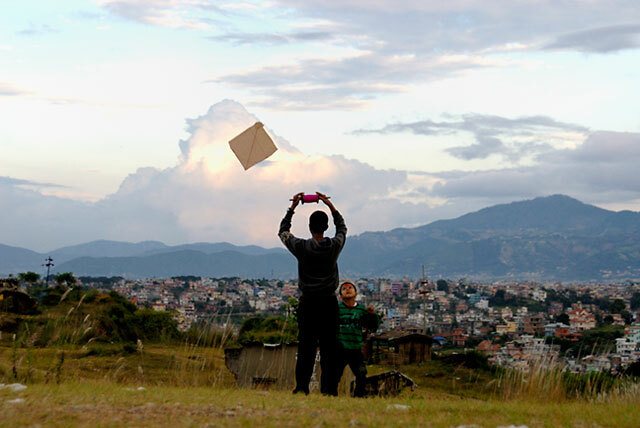 Flying colorful kites on a sunny day is a great delight to children in most urban areas. However, tradition of flying kites is declining every year. The kites in the sky this season seem dimmed. May be means of entertainment for children in today’s modern world is abound. The folklore behind flying kites is that people send message to Lord Indra (the Hindu deity of rain) to stop the monsoon rains, since Dashain festival is time to harvest the rice.